I know these aren’t exactly the most festive recipe, however, who doesn’t buy or receive a bar of this at Christmas? Instead of scoffing it down, why not use them to make a batch of these cookies… I promise that you won’t be disappointed. Who doesn’t like cookies? I mean they are so easy and tasty to make. These are perfect for using up the extra chocolate you’ve received over the Christmas period. Short on time? Don’t worry, you can make a batch of these up in 30 minutes. The cookie dough doesn’t require chilling before being baked off, so you are free to scoop these up and bake them off straight away. Anyway, you don’t need any special ingredients or equipment to make these cookies, which is always good news. A little prep work goes a long way – weigh up all the ingredients, preheating your oven to 180˚c/350˚f, line your baking trays with greaseproof/parchment and chopping the chocolate bar up. I used my stand mixer but feel free to use a hand mixer and a large mixing bowl and place your butter, granulated white sugar and light brown sugar and beat them all together until they are well combined. Once the butter and sugars have come together, give the bowl a quick scrape down, then add in your eggs (one at a time, beating well in-between each addition). Give the bowl another quick scrape down, this helps to incorporate any bits that haven’t been fully worked in. Then add in your dry ingredients by passing them through a sieve, this helps to remove any lumps from getting into the dough. Mix the dry ingredients and the chopped-up chocolate in on a low-medium speed until they are just incorporated. Once the cookie dough has formed, take two scoops of dough and scrape a teaspoon of Cadbury’s chocolate spread onto one of the dough balls and place the second dough ball on top and squish them together and roll them until they are one single ball. Then place them onto a baking tray, lining it with greaseproof/parchment is up to yourself. Leave a space in between each dough ball as they will spread while they bake. 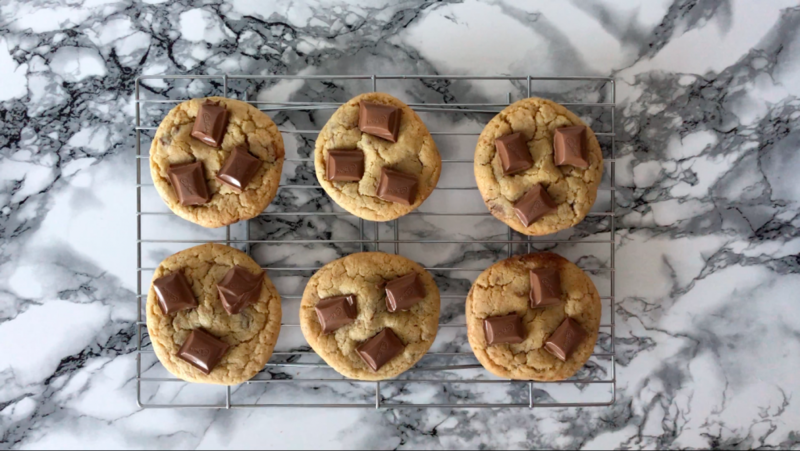 Bake for around 18 minutes in your preheated oven (or until they are golden brown around the edge, remove from the oven and optionally, place a few additional pieces of dairy milk on to each cookie and allow to cool slightly before moving them to a cooling rack. Once the baking tray isn’t so hot, transfer the cookies from the baking tray onto a cooling rack and allow to cool fully (if you can resist). 100g (1 bar) Cadbury Dairy Milk chocolate bar, chopped small. 1 small jar of Cadbury chocolate spread. Additional bar of Dairy milk for the finishing. Do some prep work. Preheat your oven to 180˚c/350˚f , weigh up all your ingredients and line your baking trays with greaseproof/parchment paper. To start the cookies, place your butter, granulated sugar and light brown sugar into your mixing bowl and beat them together, just until they are combined. Add your eggs into the bowl, one at a time beating well in-between each addition. Repeat with your second egg. Once your eggs are fully incorporated, you’ll want to add your dry ingredients in but first, you’ll want to pass them through a sieve. Into your sieve add in your plain flour, baking powder and salt, this helps to sort out any big lumps that wouldn’t pass through. Once all the dry ingredients and the chopped bar of chocolate have been added, incorporate them by mixing them in over a low-medium speed just until a dough has formed, try not to over-mix. 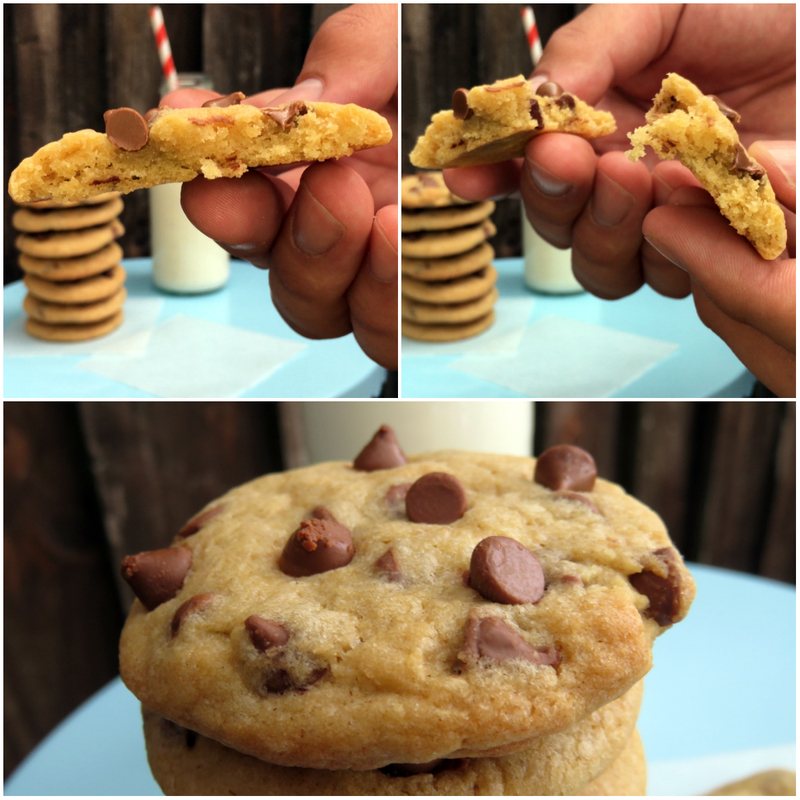 Take your cookie scoop and scoop up 2 balls of dough per cookie. 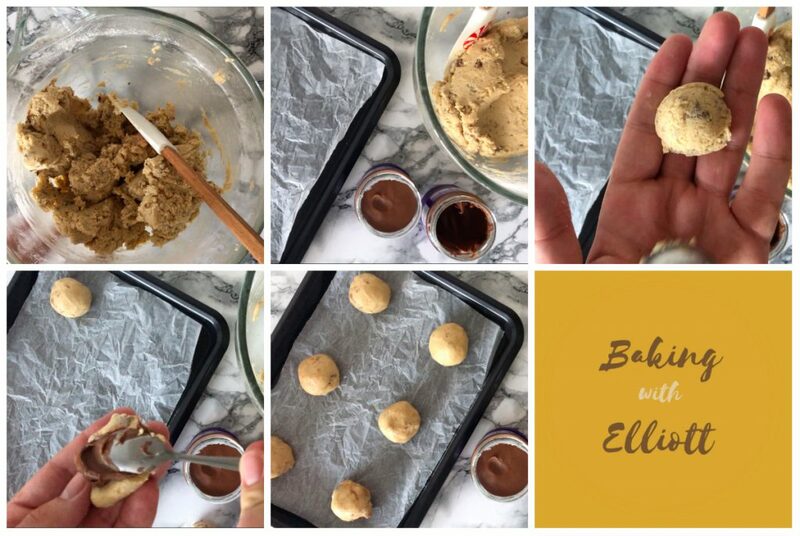 Adding a teaspoon of Cadbury chocolate spread onto one dough ball, squishing the two balls together then roll the dough between your hands to round it off and place it on your lined baking tray – I got 6 onto a standard baking tray but work with what trays you have. Leave a space in-between each cookie as they do spread while baking. You can bake these cookies straight from making them, there is no need to chill the dough first. Place the baking tray into the oven and bake for 18 minutes (remove one they look more baked around the edges, so check after the 13-15 minute mark and see. All ovens are different and will vary with baking times so keep an eye on them. 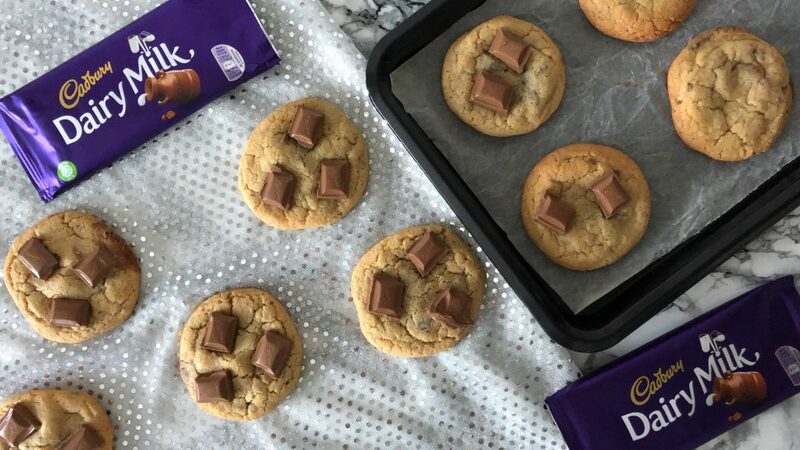 Once fresh out the oven, place a few pieces of dairy milk onto the top of each cookie just to add some more chocolate, because why not? (do you really need a reason to add more chocolate into chocolate cookies?). Transfer the cookies to a cooling rack to cool completely before enjoying (although they are amazing while slightly warm). If you have made it this far, thank you for checking out the recipe – I hope you enjoy it. These cookies will be a fantastic treat to share with your family and friends. 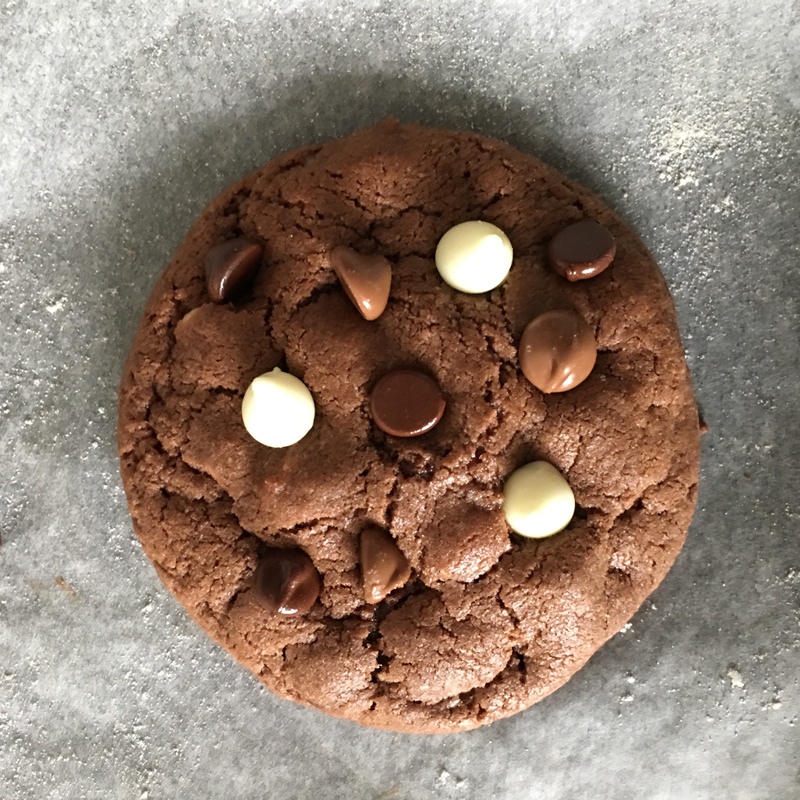 If you’re looking for a triple chocolate cookie recipe, look no further, I have you covered. That’s right, these cookies are triple chocolate, who wouldn’t want more chocolate? These cookies contain white, milk and dark chocolate chips which are studded throughout the chocolate dough. If you like chocolate, you will LOVE these cookies. As mentioned above, these cookies are super simple to make and don’t require a lot of time or ingredients to make a batch. You’ll have your baked cookies all done in under 60 minutes, who doesn’t want cookies that don’t take a long time to make? Who wants to spend a majority of the day in the kitchen? I know I don’t and can guess that you don’t want to either, if you use my recipe, you won’t have to! Before you get into making the cookies, you’ll want to do a bit of prep work. Start by preheating your oven to 180˚c/350˚f, weighing up all your ingredients, this will stop you from making mistakes later on and faffing about and finally, line a baking tray with some greaseproof/parchment paper and set them aside. To start on the cookies, you’ll want to place your butter, light brown sugar and granulated sugar into your mixing bowl of choice (I went ahead and used my stand mixer bowl but feel free to use whatever you have or prefer) and beat them together just until combined, this doesn’t take very long. You can then add your eggs, one at a time, beating well in-between each addition. Make sure you allow each egg to fully incorporate into the mixture before adding the next egg, otherwise you may curdle the mixture. Once your eggs have been fully incorporated, give your bowl a good scrape down, this is to incorporate any bits that may not have been fully worked in earlier on. Next you’ll want to add in your plain flour, cocoa powder, baking powder and salt, passing them through a sieve first to remove any big lumps that may not pass through easily. The mix in the dry ingredients over a low-medium speed just until a dough forms, then stop, you don’t want to over-mix the dough. Add in roughly about 3/4 of your white, milk and dark chocolate chips and mix them in just so they are well distributed (reserve the other 1/4 to finish them). Take your cookie scoop and scoop up two balls of the cookie dough and roll them together into one larger ball and place onto your lined baking tray, leaving space in-between each cookie as they will spread while baking (they don’t spread a lot but enough anyway). Onto a standard baking tray I place 6 balls of cookie dough but place them accord to your tray, you can then place the tray into the oven and bake for 12-14 minutes or until they are well spread and look a little more baked around the edge compared to the centre. When they are baked, remove from the oven and place onto your worktop and while they are still hot/warm, you’ll want to finish them. To finish the cookies all you need to do is place the reserved chocolate chips onto each cookie, for me I place around 3 of each chocolate chip onto each cookie, but use what you have left regardless of whether its a lot or none. Transfer the cookies to a cooling rack, to cool completely cool. Once the cookies are cooled, you can enjoy them. They are best enjoyed on their own or with a hot drink. Once your eggs are fully incorporated, you’ll want to add your dry ingredients in but first, you’ll want to pass them through a sieve. Into your sieve add in your plain flour, cocoa powder, baking powder and salt, this helps to sort out any big lumps that wouldn’t pass through. 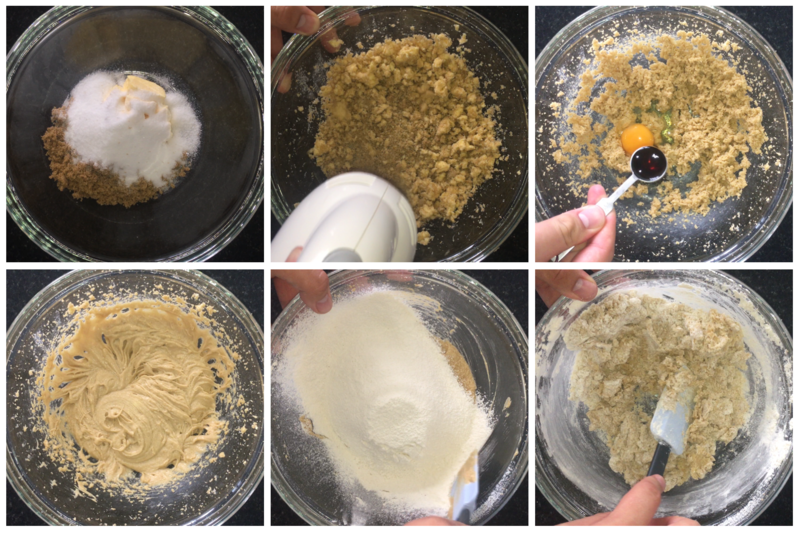 Once all the dry ingredients have been added, incorporate them by mixing them in over a low-medium speed just until a dough has formed, try not to over-mix. Add in 3/4 of your white, milk and dark chocolate chips, reserving a 1/4 to finish them off once baked. Mix them in over a low-medium speed just until they are well dispersed throughout the dough, then you’re finished mixing the dough. Take your cookie scoop and scoop up 2 balls of dough per cookie. Roll the dough between your hands to round it off and place it on your lined baking tray – I got 6 onto a standard baking tray but work with what trays you have. Place the baking tray into the oven and bake for 12-14 minutes (remove one they look more baked around the edges, so check after the 10-12 minute mark and see. All ovens are different and will vary with baking times so keep an eye on them. Thank you so much for checking out this recipe, I hope you enjoy it and get to make it soon! 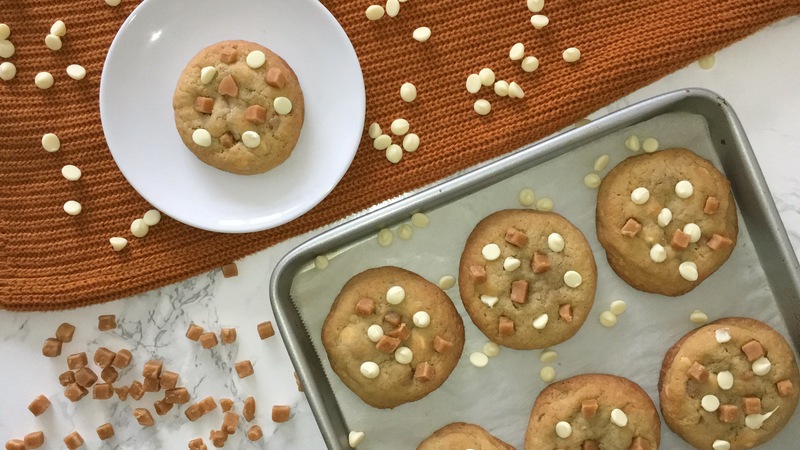 If you’ve come looking for a recipe on how to make these super simple white chocolate and fudge cookies, I’ve got you covered. As stated above, these cookies are super simple to make and don’t require a lot of either time or ingredients. 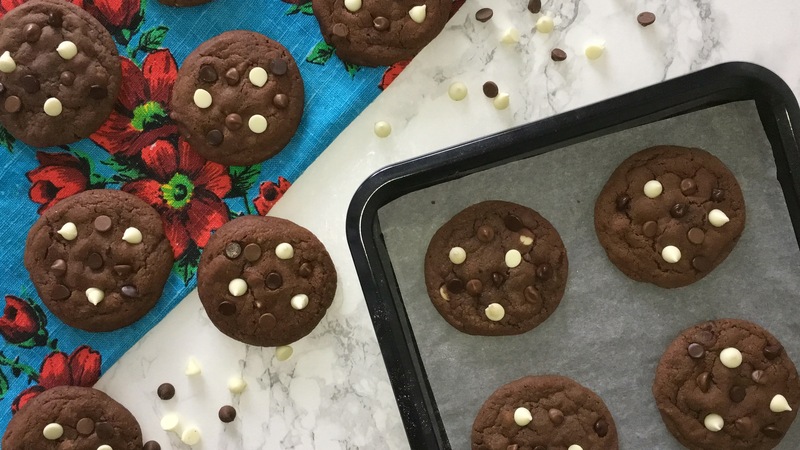 These cookies are perfect for almost any cookie craving, it starts with the perfectly baked cookie, which has a generous amount of white chocolate chips and fudge pieces studded throughout them. Oh yeah, did I forgot to mention that they have a fudge filling? That’s right, even more fudge packed into them, what’s not to like? 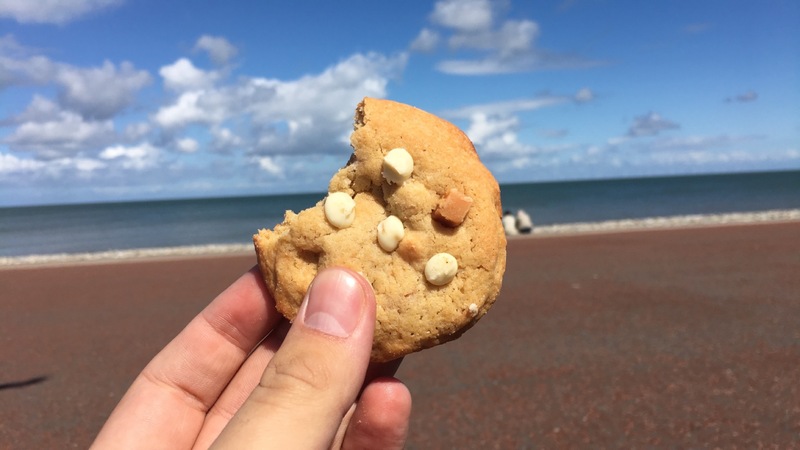 I understand that you might not be able to find white chocolate chips or fudge pieces where you are, so feel free to improvise by using a chopped up bar of white chocolate or chopped up soft fudge. For the fudge centre, I recommend using butter fudge as this is softer than other fudges and works perfectly in this recipe but feel free to use whatever you have or can get your hands on. Anyway, the mixing process doesn’t require a whole lot, a little time and effort and you can have yourself a batch of amazing cookies! The longest thing in the whole process is actually the baking period, why must you take so long to bake?! This recipe wasn’t intended for this week, but they were really tasty and thought I should share these with you as soon as possible. All jokes aside, you don’t need any fancy equipment and these would make the ideal recipe to make with kids. To start this recipe, you’ll want to do some prep work. Preheat your oven to 180˚c/350˚f, weigh up all of your ingredients (this saves you time and prevents you from making a mistake with the exact amounts) and prepare your baking tray by lining it with either baking parchment/greaseproof paper and set that aside until its needed a little later. To start the cookies, you’ll want to get your mixing bowl of choice and place your butter, granulated sugar and light brown sugar into a bowl and beat them together over a low-medium until they are well combined, you can tell once its done as there won’t be a trace of a single ingredient. Once the mixture has come together, add your egg and vanilla and mix that again on a low-medium speed until the egg and vanilla are very well incorporated. Give your bowl a good scrape down and then add in the plain flour and baking powder and mix them in over a low-medium speed until the dry ingredients are almost fully incorporated, then add in your white chocolate chips and fudge pieces and fold these in using a spatula, do this until the cookie dough has become clear (no traces of a single ingredient, all fully worked in to one another. You can then give your counter a wipe down and get your prepared baking tray ready. Once you’ve got your cookie dough ready and baking tray, you’re good to go. The dough doesn’t need to be chilled before being used, so you can use it straight away. 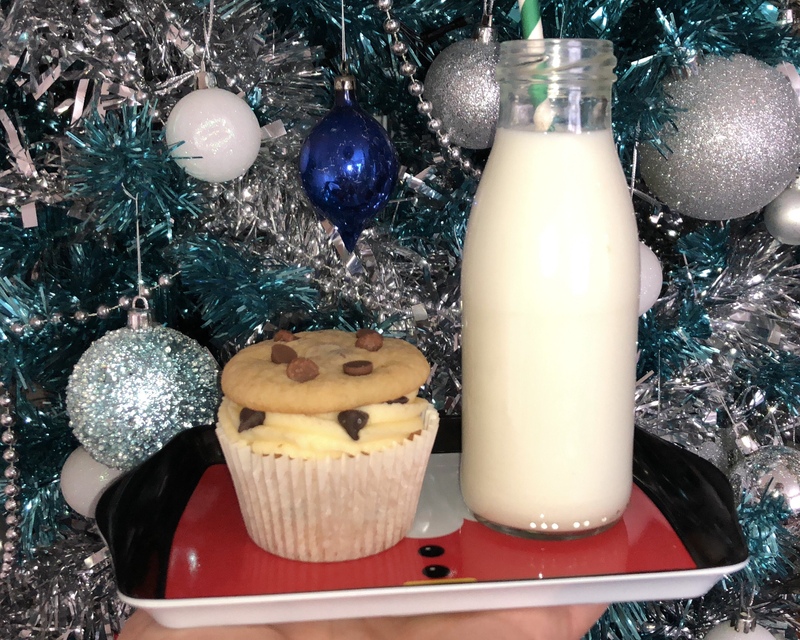 Scoop up 2 balls of dough per cookie, onto one of the dough balls, place a piece of butter fudge and place the second ball of dough on top of that one and round them up using the palms of your hands and then place them onto your baking tray. I places 6 cookies onto a standard baking tray but feel free to configure how many you can place onto a baking tray. Bake in the preheated oven for around 15-18 minutes or until golden brown. As soon as you remove from the oven, place a generous amount of white chocolate chips and fudge pieces on top of each cookie and allow to cool slightly before eating them. Transfer the cookies to a cooling rack, allow to cool for as long as you’d like (or can resist) and then enjoy them. They are best enjoyed once out of the oven for around 10 minutes – they are best enjoyed with milk or alone. I will leave all the ingredients and measurements down below along with a brief version of whats above, if you want to save yourself some time reading exactly what you have to do. 12 pieces butter fudge (or other variety of soft fudge). Start by preheating your oven to 180˚c/350˚f, weighing up all your ingredients and lining your baking tray with baking parchment/greaseproof paper. Start by getting your mixing bowl ready and placing your butter granulated white sugar and light brown sugar into the bowl and beating over low-medium speed until its combined. Once combined, you can add your egg and vanilla and beat that over a low-medium speed until they have been incorporated into the mix. Scrape down the bowl and add in your flour and baking powder. Mix this in on a low-medium speed until its almost fully combined, then add in the white chocolate chips and fudge pieces and fold these in by hand using a spatula. Do this until a clear dough has formed. Once a dough has formed, get your prepared baking tray and scoop up your dough. For each cookie, you’ll want to get 2 scoops of dough, onto one half of the dough place a piece of butter fudge and place the second dough ball on top, then round them off using the palms of your hand. 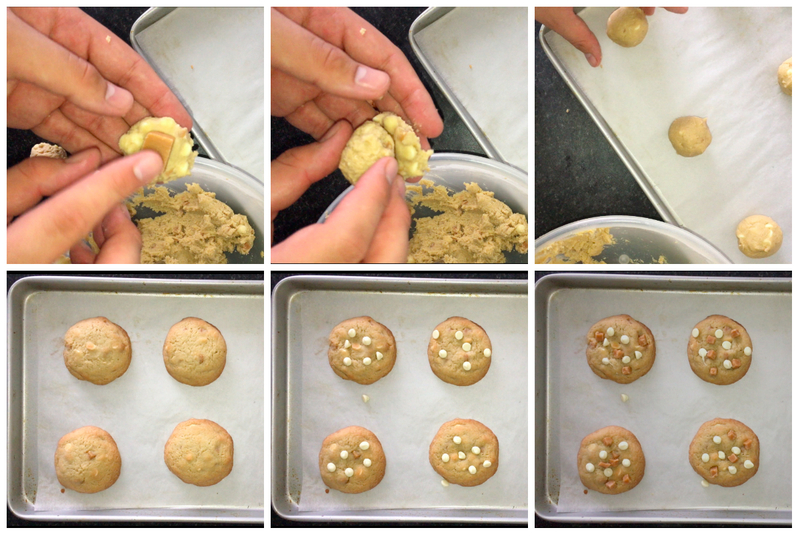 Place onto your baking tray and fit around 6 cookies onto a standard baking tray. Place your cookies into the preheated oven and bake for 15-18 minutes (or until golden brown). Straight out the oven, place a generous amount of the white chocolate chips and fudge pieces on top of each cookie and allow to cool slightly on a cooling rack before eating. Once cooler, enjoy by itself or with a glass of milk. 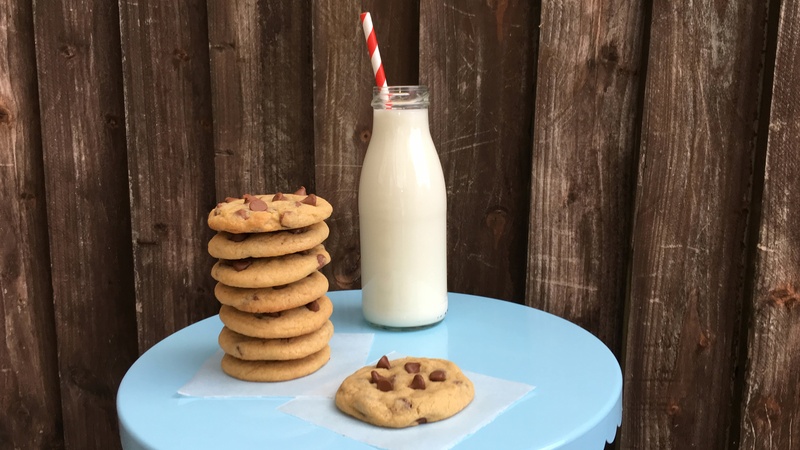 If you’re looking for a chocolate chip cookie recipe that won’t disappoint, you have come to the right place. This recipe is super simple to make and best of all doesn’t take too long to make either, you’ll be able to have a batch of these made up in under an hour. What’s not to like about these?! As I mentioned above, these cookies are quick and easy but are also budget friendly. Another great thing about this recipe is that it freezes really well, you can make the dough and get your scoopfuls done and freeze them and whenever you want to pull them out the freezer you simply place them onto a baking tray and bake in your preheated oven (a great idea around the holiday season or for school bake sales, it’ll save you time when you haven’t got it!). The other way is to bake the cookies off and then freeze them if you don’t intend on eating them right away (best to place them into a freezer bag) and whenever you want them, you take them out and defrost them. That way you can have your cookies whenever you like! Just like the minimal ingredients, then method if the same. Just a few simple steps and you’re done! Before you get into making these, you’ll want to do a bit of prep work. Preheat your oven to 180˚c/350˚f, prepare your baking tray by either lining it with greaseproof/parchment paper or generously buttering the tray and the final bit of prep is to weight up all your ingredients (this eliminates the chances of getting the measurements wrong and save you faffing around while making the dough. Into your mixing bowl of choice, place the butter and both sugars and beat on a low-medium speed until they have become well combined. Once combined, you can then add in your egg and vanilla and mix that again on a low-medium speed until its well combined. Next you’ll want to add in your dry ingredients but before you go dumping them into the bowl, you’ll want to sieve them. Sieve them directly into the bowl and then fold them in using a spatula until almost fully incorporated, this is where you’ll want to add your chocolate chips in and mix until you have a clear dough. (by a clear dough, I mean there are no traces of any of the ingredients, they are fully incorporated. Now that you’ve got your dough, you’ll want to use a cookie or (small) ice-cream scoop, (these are readily available online for pretty cheap) and scoop up the mixture filling the scoop all the way. Remove the dough from the scoop and round it up using your hands, then flattening into a disc shape. If you want to get even more chocolate into these, add a few more chocolate chips on top, pressing them down lightly (here is where you could freeze them to bake off at a later date). Place onto your prepped baking tray, I used a standard size one and got 12 onto it. You can then place the tray into the oven and allow to bake for 10-12 minutes (I found that around 11-12 minutes was perfect for me). 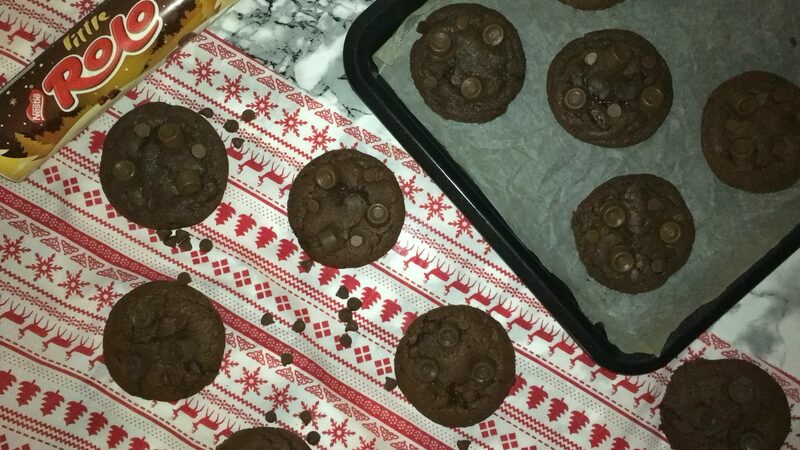 Remove your cookies from the oven (add some more chocolate chips on top, pushing them into the cookies while they are warm, maximise the amount of chocolate) and allow to cool on the tray for 4-5 minutes, then transfer them to a cooling rack so they can cool completely. You can enjoy them slightly warm or completely cool. These will be best eaten on the day they’re made but will last for up to 3 days in a airtight container (at this stage you can freeze them.